Today I will start with reading OD&D from cover to cover, line by line. For me this is going to be a very interesting experiment as I usually do not read any RPG rules completely (ever - I skim through them and use them, but reading rules completely to me would be like reading my VCR manual completely). Nonetheless I am really looking forward to this as I believe that many folks ever read OD&D completely and thus many of us will be in for some surprising facts concerning the original ruleset and its rather skimpy writing style. For each page I will create new content in 'The Fantasy Game', picking up the ideas behind the content parts of OD&D but completely rewriting the texts (and also the rules for some parts). 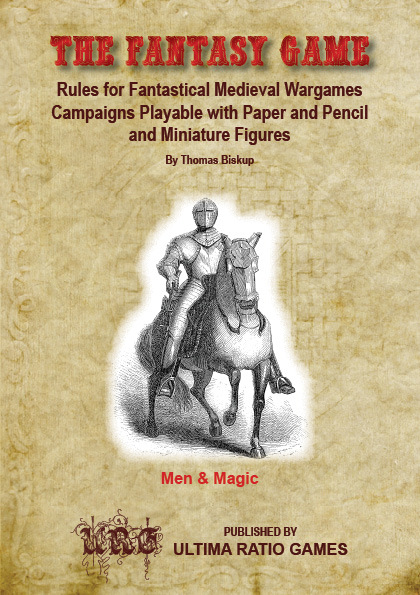 The most interesting (and only noteworthy) fact is the sub line of the game's name: "Rules for Fantastic Medieval Wargames Campaigns". Obviously we have reached the dawn of our hobby, role playing not yet is a household name and thus we are going to do wargames campaigns. This already in some respect announces the resource management part deeply embedded in D&D - from counting coins for equipment to managing hireling loyality. Nonetheless it is also very interesting that later on we will see very little of the precise wording that usually is associated with wargames. Reading a typical Avalon Hill cosim manual always felt like a reading a law textbook (most likely because these manual were actually written by real life lawyers quite often), but here we have to see that wargaming and conflict simulations at the dawn of our hobby still were distinct genres. As they are today BTW, only that now we differ between tabletop gaming and conflict simulations. The former is the real source of roleplaying games, which is important to keep in mind for casual and younger readers of this blog. So we should keep in mind that the origins of RPGs lie in fact in tabletop gaming, miniature play and smaller unit combat. Which very obviously mirrors in the game as only the most important concepts are picked up from such games (like movement rates, morale, etc.). This we will elaborate upon when we proceed with the next pages of OD&D. The remainder of the sub line of the game name ("Playable with Paper and Pencil and Miniature Figures") also stresses this although the miniature aspect of the original rules mostly probably is represented by the casual connection to Chainmail (as far as I know for now - as mentioned I never before read the original rules in any detail). More on that in the appropriate sections. 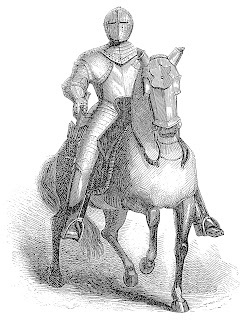 The warrior depicted is an early fantastic image of a fantasy warrior (as can be seen by the horned helment, the rather unusual armor spikes, the bared lower arms and the two weapon fighting style implied by the weaponry). In a real world context it probably would be very funny to see the warrior trying to put up a decent fight given the fact that a shield is dangling from his left arm, which would render the usage of the dagger completely useless (we are not talking about a buckler here). So we obviously are in the realm of fantasy. I'm curious to see if there are any rules for two weapon fighting in the original rules (I can't remember any from paging through the rules). We'll get back to that when we get to the combat sections. The consequences for 'The Fantasy Game' were already explained in my previous post by providing a design study for the new cover. The version to the right already has been slightly improved by trying to find a better vertical balance for the various elements. I did not have any qualms about updating the layout to a somewhat more modern feel. I tried to keep all the important elements in touch and only moderately pimped the design by using a modern paper background, some satin effects for the game name and some shadows. I'm not yet happy with the image selected although I like the image itself. But I would prefer to add it transparently to the background (without any of the white noise). The latter has been a compromise to my limited abilities with Adobe Indesign and Adobe Photoshop - if anyone has any advice on how to transform the picture shown below to a completely transparent image married with the background, I'd be grateful for suggestions. Ultima Ratio Games is a (yet) fictious company name. The domain name has already been registered and maybe at some point I actually might create the company with the goal of publishing my various old school design efforts (Hexer & Helden, Gaia Gamma and this one here). For now it is just a placeholder in order to respect the original design as is the URG shortcut (BTW done in Saraband Initials - a font I love dearly). The game name logo is set using the Quentin D font (which I bought for Hexer & Helden but happily am going to reuse here). I absolutely recommend the TSR & WotC Font FAQ if you want to learn more about the various fonts being used in the various games by TSR and WoTC. The cover background is taken from the (again legally purchased ;-) Book of Fire templates available at RPGNow.com. 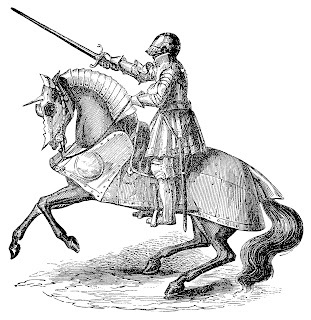 I selected this picture because I loved the way the knight seems to be looking directly at the observer which gives the whole picture a very vivid feel (as far as I am concerned). My wife commented that she felt at first glance that it was not dynamic enough. Her vote went to the the following picture taken from the same CD - what do you think? A criticism that applies to both pictures might be that the fantasy aspect of the game is not mirrored in any way. That's natural due to my initial decision about only using historical imagery (there is ample stuff for fantastic beasts, but fantastic warriors do not seem to have been a favorite topic). So I might have to rethink my stance on that part - any comments? Hey there. Should be a fascinating process! Just be sure to keep beating your head with a large d20 occasionally, just to clear away baked- in preconceptions. For me, anyway, that was initially the most difficult part of really seeing what the original rules were all about. As for the image: I'd vote for the second one, too--it's more dynamic. However, I'd also vote against any armored knights on the cover---again, for me, that implies Arthurian fantasy in particular. I'm no expert, but I think in Photoshop you can actually go into the image and hand-paint away the white color surrounding the image itself. I'm looking forward to reading about your progress!